Transliteration: For the transliteration of Persian words, authors should follow either the Iranian Studies scheme outlined in the tables in the document below, or else that used by The International Journal of Middle East Studies (minus the diacritics but with macrons). 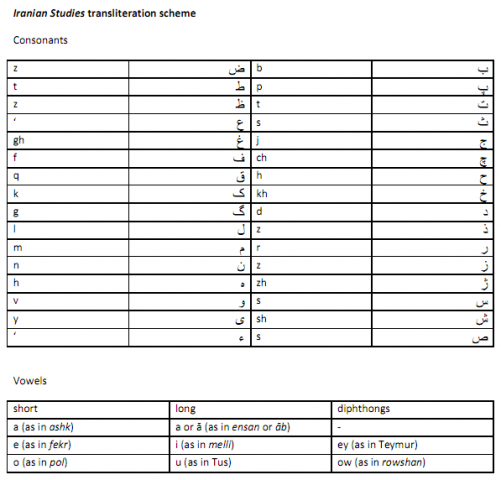 For the transliteration of Arabic and Ottoman Turkish, authors should follow the modified IJMES scheme. However the use of established anglicised forms such as Kurdistan, Hafiz, Isfahan, Majlis (instead of Kordestan, Hafez,Esfahan, Majles) will be more appropriate. Whichever scheme is chosen (Iranian Studies or modified IJMES), it must be strictly adhered to. Failure to do so will result in the submission being rejected, even if it has passed peer review.